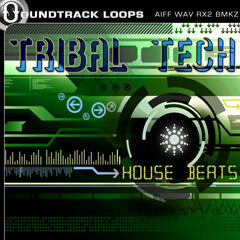 Tribal Tech House Beats by Soundtrack Loops is a modern beat collection for producing Tribal House and Tech House. There are 135 loops in total. BPMs range from 115 to 130. Sounds include combination grooves as well as isolated percussion layers. There are at least three variations of each combination. Among the variations you’ll find intros, minimal beats, complete beats, and break downs. Inspired by artists such as John Dahlback, Afrojack, Harry Choo Choo Romero, Dennis Ferrer, Ben Sims, Adam Beyer, Johnny Fiasco, Olav Basoski, Angel Alanis, Onionz, and Ian Pooley. Our loops are compatible with programs like Ableton, Acid, Garageband, Soundtrack Pro, Logic, Cubase, Pro Tools, Stylus RMX, and more. 24 bit 44.1 kHz Stereo files.